I dabble in video editing, and when working on even the shortest of motion graphics clips, the exported files take up quite a bit of space. For all of you heavy Mac users out there, I'm sure you know my pain. After a short period of time, our computers tend to slow down due to the high demand of storage space we need. Slowing down is not an option for me, and replacing a Mac for the latest and greatest isn't viable. So how can we keep our machines fast for the longest amount of time possible? The beautiful thing about Macs, in comparison to Windows, is that apps lack an installation process with files going to different areas of your hard drive. They all stay compiled into one "App" file. Taking advantage of this, we can move all of our hefty apps and support files over to an external drive to free up space on the built-in drive, and in short, speed up your system. 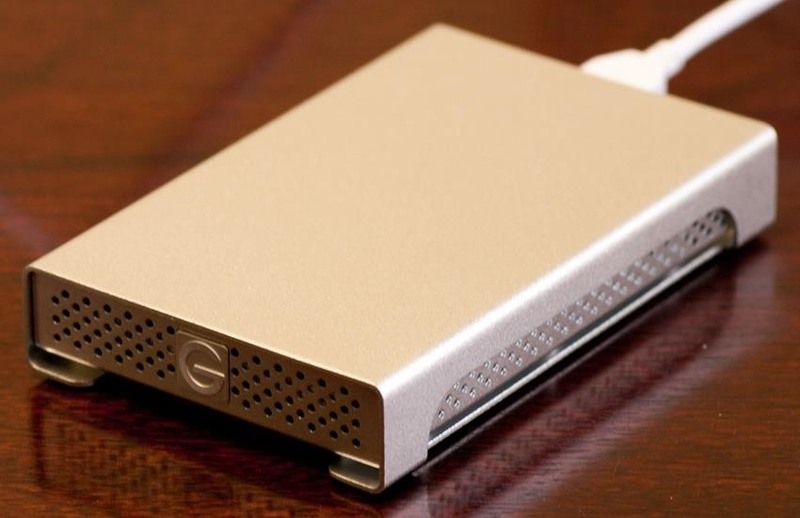 The best external drives for Mac computers are undoubtably G-DRIVE ones. They're reliable, they're sturdy, and they're fast. Those are three things that are going to come in handy for our use. 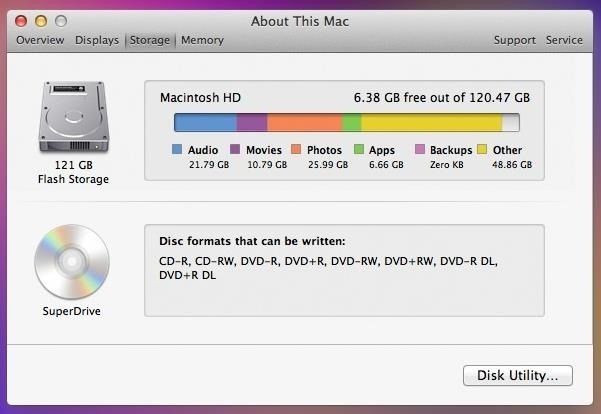 You have options on external drive sizes, and the size necessary for you directly reflects the amount of space you require for the tasks you complete on your setup. Of course, there are many options for choosing a drive, including a few from Apple themselves. In my case, I chose a 1TB drive. Video exports can pile up quickly when working with HD content, so getting the biggest drive possible for me is a necessity. For lighter users, you may want to save a couple bucks and get a 500GB drive. And if your Mac supports it, make sure you get USB 3.0 drives, because the speed difference is amazing. Of course, you don't have to stick with a G-DRIVE. That's just what I use. As long as it's USB 3.0 and has a fast drive speed, you should be good to go. 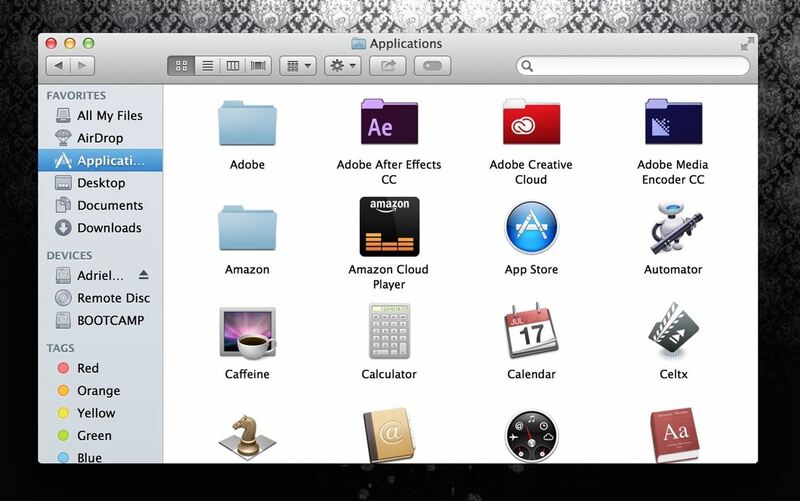 Now it's time to move apps over to your new drive and clear off your internal system space. 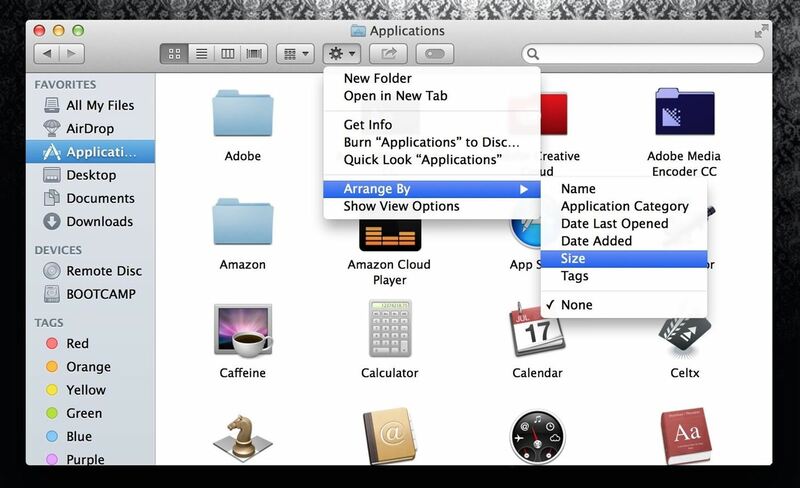 Go to Finder and open up your applications folder. Copy all the applications that take up the most space—to see what those are, we're going to sort our files by size. Click the gear symbol, choose Arrange By, and select Size. Feel free to leave certain apps that are light, for ease of use. 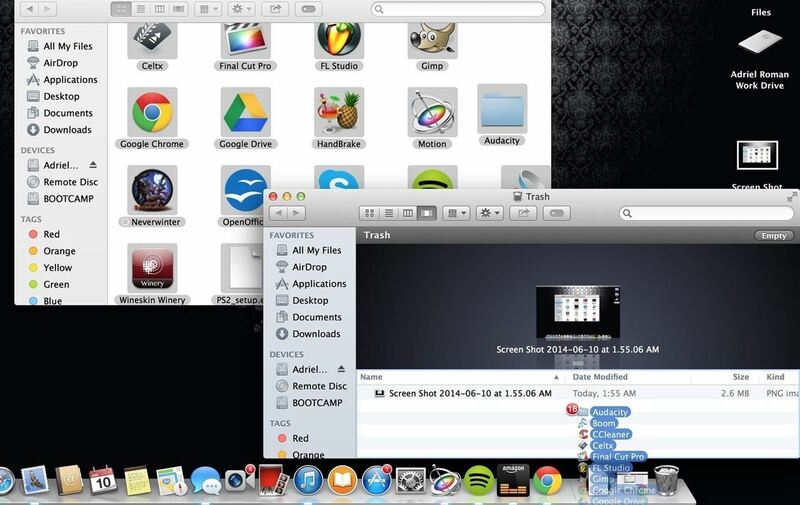 For example, you may keep Safari, Google Chrome, etc. on your internal hard drive, because they're light and will still allow you to use your internet browsers when your external drive is not plugged in. The smaller files are sorted on the lower sections of your Applications folder, if sorted by size. Now you're going to paste all your applications into your external drive. You may want to make a folder and paste into it to keep your drive organized. It's time to say "Bye, Bye," because we're now going to delete the applications off of your computer's internal hard drive. Don't panic. 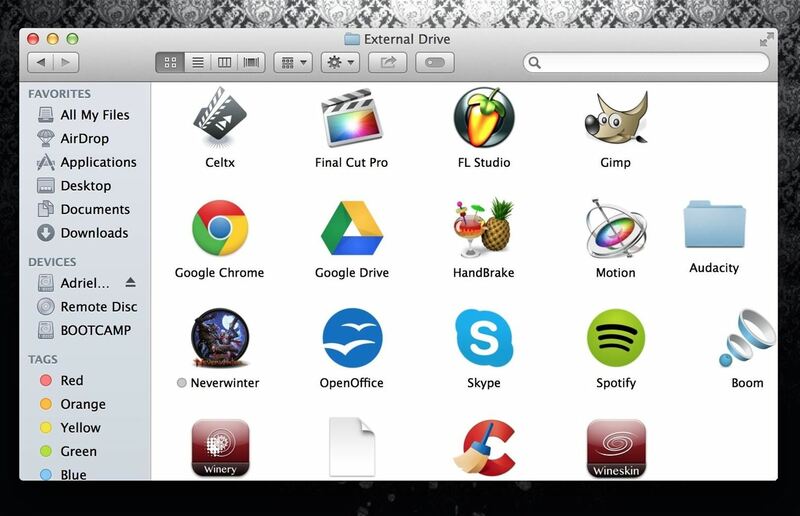 All of your apps are fully executable directly off of your external drive. As long as it stays plugged into your Mac, you still have easy access to everything. The difference now is that your hard drive is clean, allowing the disc to read and write less, and reduce search times. 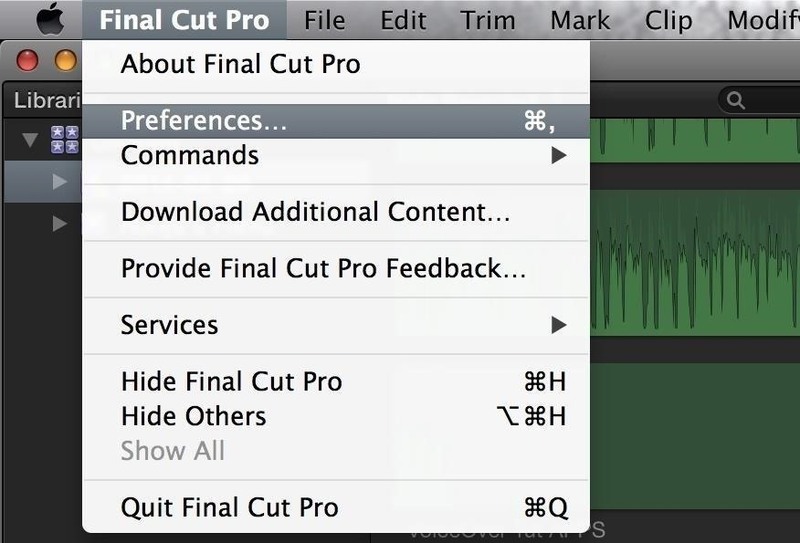 Some apps, such as Final Cut Pro X, have set file destinations to auto save files, exports, cache, etc. 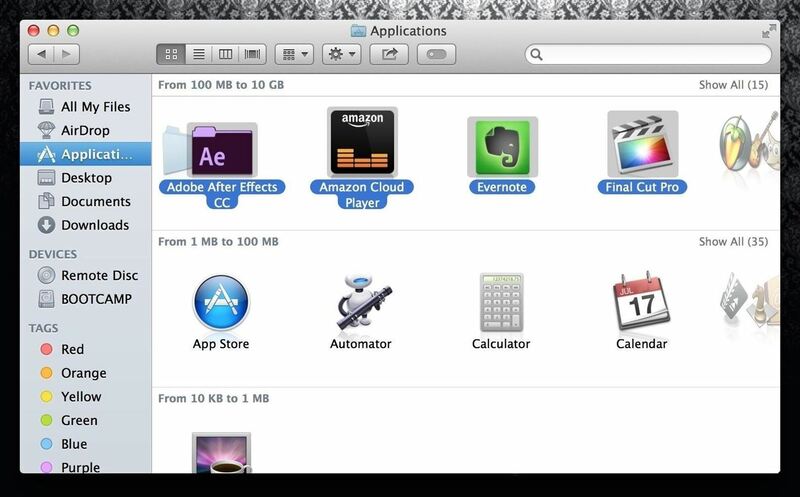 If you have any apps like this, you must change the file location or it will continue to write files to your hard drive, even if the application runs off of a separate drive. Once your program has launched, open its Preferences. Every program is different, but what I'm looking for here, in Final Cut Pro, is something that tells me that things are going to be saved or recorded to a certain folder on my hard drive. I found that it was saving my Library backups to a folder called FCB on my internal hard drive. I switched that over to my external drive so all the files that back up from this point on will stay off of my computer's internal drive. This prevents anything else from writing to my hard drive, keeping it clean and optimized. Applications don't have to be your only focus when switching over to an external drive. They usually take up the most memory on a system, but you do have other options to switch over as well, such as music, photos, videos, notes, documents (Pages documents, Word documents, etc. ), ebooks, and more. All these things take up space, thus resulting in an inevitable slow down. But, if we take the right steps, we can figure out ways to prevent it. My Mac still runs like it did day one, and I plan on keeping it that way. Everything was fine except iTunes. Won't open the App itself, just opens the menu bar- so I would be forced to either make my iTunes Library one giant playlist so I could import it, or do it one song at a time because that is the only option it gives. So guess I am stuck with iTunes being on the MacBook drive, instead of the external. It may have something to do with the GDrive not being able to be "authenticated". I can over-ride it but maybe the GDrive still doesn't recognize the App. Carbonite will not back up external drives on MAC systems. In the third section, where you say "we're not going to delete the applications off of your computer's internal hard drive." I think the word NOT is supposed to be the word NOW? It makes no sense otherwise, and confused the hell out of me at first. Perfect :) i wasn't trying to be awkward by the way, I just noticed it! Hi - this is really helpful, thanks. Just about to buy a new Mac and want some info which might help me not spend more than I need to...I was wondering whether you can move preinstalled programs like GarageBand, etc. onto an external drive? I realise it probably won't with iTunes, but the more I can shift off that I wouldn't use that often, the better...thank you! 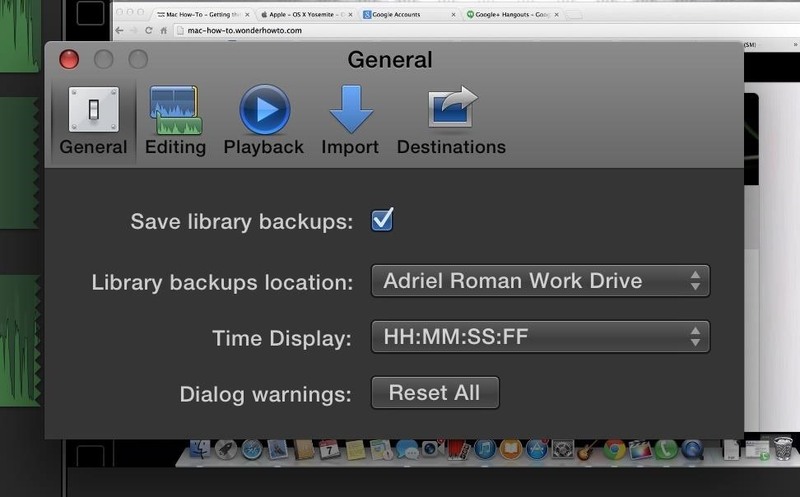 Hi,when I click on the FCP >preference>general there is only time display and dialog warning.there isn't save library backups and library backup locations.so I m not able to choose my library backup locations to my external hd.i m trying to use FCPin my external hd.same reason internal hd is eating too much space for FCP.any tips will be very helpful.Thanks.btw my external hd is toshiba canvio slim ii 1TB. Great article, thanks so much! I plan to do this tonight! One question, is there a way to move the apps within iTunes? I have all of my music and videos saved to my external drive, but there doesn't seem to be an obvious way to save the apps elsewhere. Any advice? Thanks! Hey. My Mac hard drive has a lot of movies and photos taking up the most space. If I move these to external drive, will this speed up the Mac? Thank you for answering/helping. My Mac often runs slow....so I'm thinking this will help. RE: my MacBookPro (early 2015) (with 120 GB storage) ..... trying to free-up hard drive space; moved all Applications possible onto an external hard drive. (Seagate Slim 1 TB) per your instructions! Thanks! H o w e v e r . . .
when i go into "About this Mac>Storage", it tells me i still have 53 GB in Photos, even though i have moved ALL photos off my MacBookPro, and have set options in iCloud to NOT automatically upload into iCloud Library, nor import into Photo Stream, nor to Create iCloud Photo sharing. Is it still storing "dupe photos" from the cloud onto this hard drive?? Confused!